Faceoff is a thriller fan's dream. It is a rockin' good anthology. The idea of a bunch of huge names in the thriller book world clashing head to head in battles with some of their best characters is cool. Although I have not read all of these authors books. Some were new to me authors, others it has been a while, and then there were my favorite authors. What I found the most interesting was the background story about how the two authors met and came up with the short stories. I liked getting this information prior to me reading the story. It added to the stories and helped them. Some of my favorite stories were written by Dennis Lehane vs. Michael Connelly, R.L. 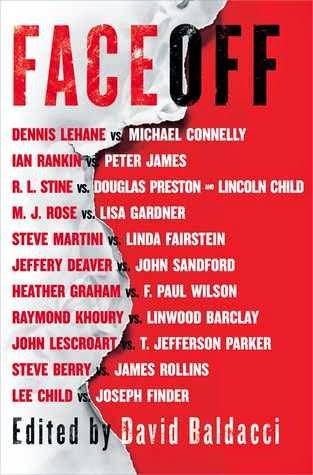 Stine vs. Douglas Preston and Lincoln Child, Steve Martini vs. Linda Fairstein, and Lee Child vs. Joseph Finder. Pick up several copies of this anthology for yourself and a friend. You and your friend could have your own read "faceoff".